Can be used with Mosaic stroller and in car. For new-born up to 13kgs. DescriptionTravelling with an infant or young baby in France? Head support designed for newborns. Follow carefully provided instructions for use. On back seat of the car, with 3-point belt or on its in-car-base (safer). On front seat of the car if no activated airbag. Fixes safely to base with one click. Correct position indicator to show if the seat is at the correct angle. Hired with apron and rain cover. Suitable for infants up to 13 kgs (about 12 month old). For usage in car, we recommend hire of car seat + in-car-base. 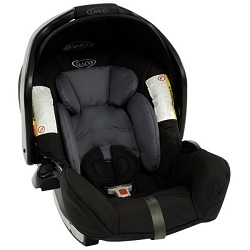 Travelling in France by friends or enjoying visiting the country, a baby car seat rental can be mandatory. For infants, we've selected the Graco Junior Baby model for its "easy to use" side and its compatibility with the Graco Mosaic city stroller available for renting. And as parents do not always chose to enjoy holidays in large cities, we deliver it anywhere in France (by carrier).